Sardis Road is a rugby union stadium situated in Pontypridd, Wales. It is home to the Principality Premiership team, Pontypridd RFC and previously the Celtic Warriors, the now defunct regional rugby union team. It is commonly known as the "House of Pain". Pontypridd RFC originally played their games at Taff Vale Park in Treforest, later they moved to the People's Park before finally moving to the Sardis Road ground. It was officially opened in September 1974 and currently holds 7,861 spectators. It has been host to Argentina verses Western Samoa in the 1991 Rugby World Cup in which Argentina lost 12–35. The Celtic Warriors used Sardis Road between 2003–2004, however with their demise, Pontypridd RFC have become a semi-professional club and Sardis Road has been mooted as being too big for the crowds that attend their matches. A planning application for a retail store on the Sardis Road ground was turned down by the National Assembly for Wales. 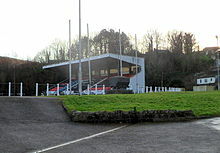 The owners of Sardis Road, Ponty Rugby Limited had hoped to sell the ground to a property developer, Morbaine Limited. It was envisaged that a new 3,000 seater stadium would be funded from the sale of the Sardis Road ground. In 2009, Sardis Road hosted the Wales versus Ireland rugby league semi-final of the European Cup. ^ "End looms for Pontypridd home". BBC. 2005-02-11. Retrieved 2008-08-07. ^ "1876-1998". www.pontyrugby.co.uk. Archived from the original on 2008-03-09. Retrieved 2008-08-07. ^ "Retail setback hits Sardis Road". BBC. 2006-06-13. Retrieved 2008-08-07. ^ "Wales 42-12 Ireland". BBC. 2009-11-01. Retrieved 2009-11-03. This page was last edited on 24 September 2017, at 11:45 (UTC).